Black caterpillars, the larvae of butterflies and moths, are voracious eaters that may attack trees, vegetables, fruit and occasionally perennials. A few insects likely won't cause much damage, but severe infestations can destroy a vegetable garden or even kill mature trees. Fortunately, several relatively safe methods quickly dispatch these hungry pests. Many caterpillars are green, but some may be black, blue, purple or red. 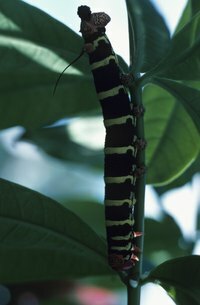 The Cecropia moth larva is black in the early larval stages, but turns green at maturity. It feeds on tree and shrub leaves, including plum, cherry, elderberry, maple, lilac, birch, walnut and others. Catalpaworm larvae may be black, although they are sometimes green or tan. These larvae feed almost exclusively on catalpa trees. Black cutworms are very common and may be black, gray or brown. They are usually hairless. Black cutworms feed on many vegetable and fruit crops, and may attack ornamentals as well. Unlike aphids and leafhoppers, which damage plants by sucking the juices, caterpillars eat leaves, sometimes feeding voraciously. They may cause holes in the leaves or ragged edges, or they may defoliate a plant entirely. One of the simplest ways to control black caterpillars is to hand-pick them. Wear gloves if you're squeamish, and pick the caterpillars from under leaves. Drop them in a bucket of soapy water, and leave them overnight to destroy them. Wrap a tree with a piece of heavy burlap 36 inches wide and large enough to fit around the tree. Tie the burlap in the middle with a piece of twine to secure it. Bend the top portion of the burlap down over the bottom portion to create a tent. Caterpillars will hide in the fabric during the day. Remove the fabric and shake the caterpillars into a bucket of soapy water. Spray vegetables, shrubs and small trees with insecticidal soap, covering the bottoms and tops of the leaves. The insecticidal soap coats young black caterpillars' bodies, causing them to dry out and die. Bacillus thuringiensis (Bt) is a naturally occurring bacteria that paralyzes the digestive system of black caterpillars, causing them to slowly starve to death. Spray the leaves well, and wait several days for the product to work. Bt does not affect beneficial insects and is safe on food crops.